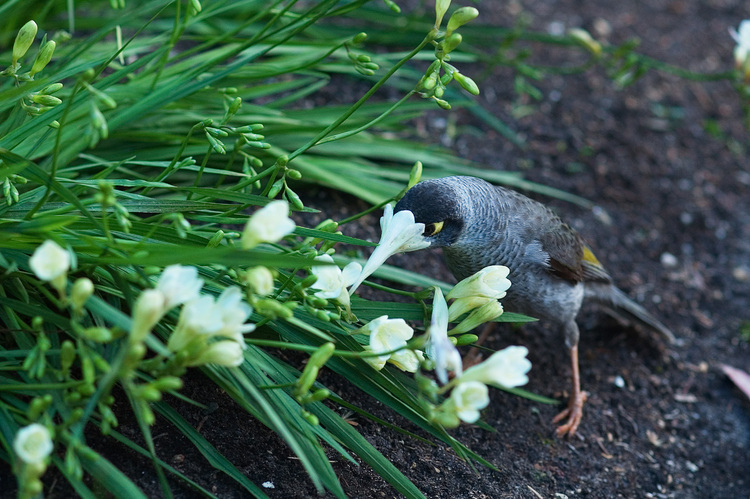 When I dropped by the Adelaide Botanic Gardens, at lunchtime, I came across this Honeyeater (I think it's a Honeyeater) working away quietly on a bunch of Freesias. He (she) was very unfazed by my presence — I was about 6 feet away when I took these shots. Details: Nikon 105mm 1:2.8 macro, ~f/5.6, 1/200s, ISO 200. These are great! I love the way the bird strains up on its little legs to reach the blossom in the second picture. LOVELY! I might need one of those macro lenses, too! These shots are crisp! I really like the second one showing us how they eat the nectar. Quite interesting, indeed! 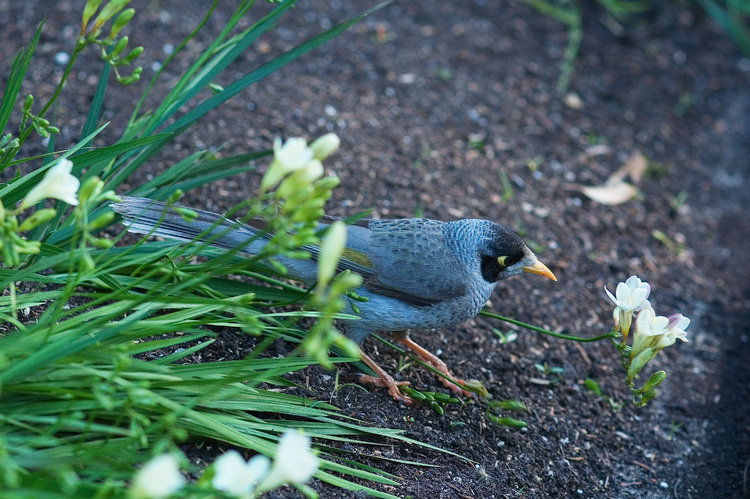 I Google Image searched "Noisy Miner" and that's most likely what this guy is - there are something like 30 birds in the family of Meliphagidae - they're interesting birds, as I've never seen anything like them. Neat! Yeah, the second image is key, showing the nectar gathering process - cool to see a visual demonstration of how nature ensures compatibility since the shape and length of the bird's beak is so perfectly suited for those blossoms.